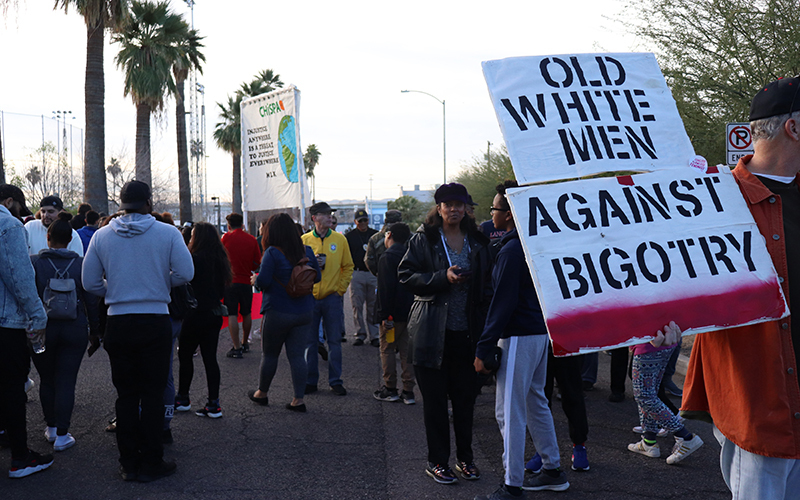 PHOENIX – Thousands of people, from families pulling children in wagons to elderly women pushing walkers, celebrated community, connection and Martin Luther King Jr. in a march through the streets of downtown Phoenix on the MLK holiday. Along the way, a refugee, a family of four, an optimist and a protester against police violence marked the journey. 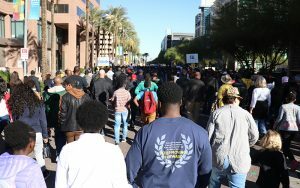 Ejeck Delphine, 38, who said she fled violence in Cameroon, Africa to come to Arizona nine months ago, said Monday was her first year in the annual MLK march. Organizers said the march has been happening for more than three decades. She was excited to celebrate King, who fought for civil rights for African Americans and a belief all people, regardless of race, creed or color, shared a responsibility to create a more equal world. Marveling at the crowd of black, white, Latinos and Asian-American people at the march, she recounted her time at the Eloy Detention Center as a refugee. “The church people were coming to the detention encouraging me. They’re white. Encouraging me, a black. I was so impressed,” she said. Delphine said feels safe being in America. As the crowd headed along downtown on 5th Street, Albert Summons walked with his three young daughters. As one of them perched on his shoulder, he spoke of talks he has with his family about the struggles and violence involved in King’s battle for civil rights.